What’s the best way to get your supporters to campaign, when the finer details of what they’re pressing for may vary from place to place? That’s the issue that faced Prostate Cancer UK as they call for better provision for men across the country with erectile dysfunction as a result of prostate cancer. There are five core treatments for tackling erectile dysfunction, but whether all of them will be offered to you depends on your postcode. In some areas, all are offered as standard, while in others there may be none. The tool we built for Prostate Cancer UK used several of mySociety’s areas of expertise, from mapping to user testing — we even used Freedom of Information. And putting it all together, we have a powerful campaigning platform that responds to users’ location, while raising awareness and pushing for improvement. 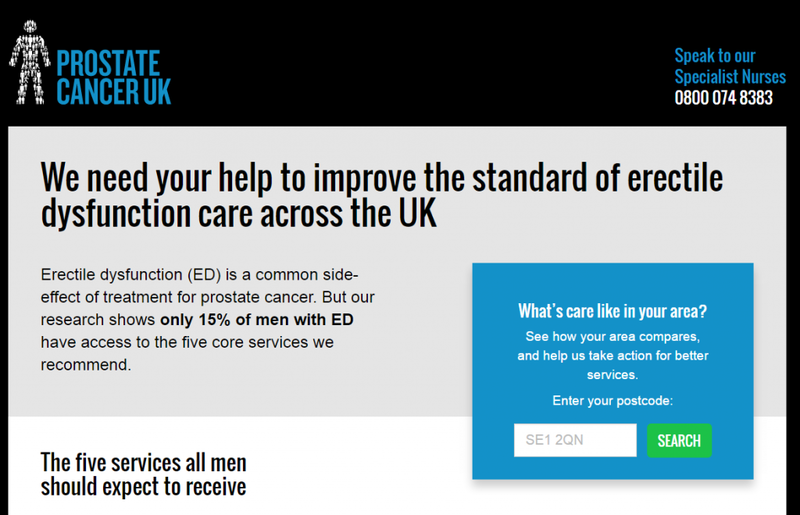 Prostate Cancer UK’s Erectile Dysfunction campaign site informs people about what care should be available to those who experience the condition as a result of prostate cancer treatment, and urges them to write to their local health commissioner if provision is poor in their area. The user is first informed: they are shown the five factors which constitute good treatment of erectile dysfunction. 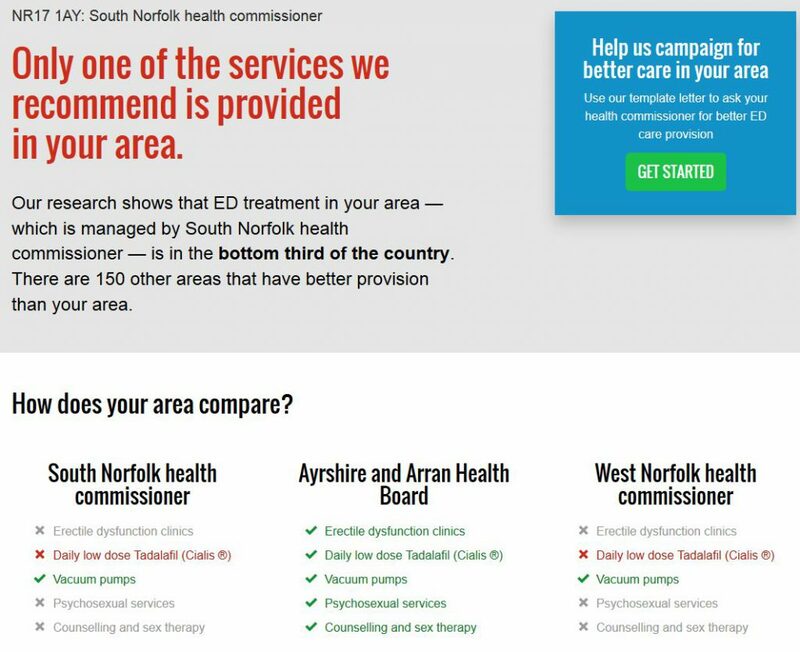 After that, they are prompted to input their postcode to see how many of those measures are provided by the NHS body responsible for their region. If provision is poor, they are encouraged to help campaign: users can opt to write to their Clinical Commissioning Group (CCG), Health Board or Health and Social Care Board to ask them to improve what’s available. They are given the choice between writing a letter from scratch, or using a pre-composed template which also contains a section for the writer to add a paragraph of their own words — a pragmatic balance that avoids an influx of identical form letters, while still addressing fact that when users are faced with a completely blank page, many will drop out of the process. When you’ve done that, for those in England there’s also an opportunity to contact Jeremy Hunt, Secretary of State for Health to highlight the variation in treatment for erectile dysfunction and establish which organisation is responsible for the national commissioning guidelines. Finally, the user is invited to share what they’ve learned, via Facebook, Twitter or email. Our user testing revealed that, contrary to our worries, people were happy to do this without embarrassment. Like most of mySociety’s own sites, the ‘Better Care’ site uses MapIt to match the user’s postcode with a boundary, in this case the boundaries of the CCGs, Health Boards and Health & Social Care Boards. That’s how we deliver the information about what’s available in their local area. When you input your postcode to see how your local provisioners are doing, MapIt also delivers information for other areas, including a couple of close neighbouring ones. This allows us to provide a nice comparison, along with the statistic that shows whether your provisioner is better, worse, or within the same range as the average. But how did we gather the data to tell you how well each CCG, Health Board or Health and Social Care Board is catering for erectile dysfunction patients? Well, fortunately, thanks to our own WhatDoTheyKnow website, it was relatively easy to send a Freedom of Information request to every one in the country — 235 of them in total. The WhatDoTheyKnow volunteer admin team were able to help with this large batch request. Once we had all the data and a general idea of how the tool would work, we took an early version out to test it with users. The insights we gained from this process were, as always, extremely useful, and led to us altering page layouts and other elements that made the whole process as clear as it could be. Finally, we incorporated quite a bit of statistics-gathering into the whole tool, so that Prostate Cancer UK would be able to see where their campaign might benefit from further optimising in the future. All in all, we’re very glad to have been part of this important campaign to help men understand what’s available to them, and where they might need to push for more.